Guess what? 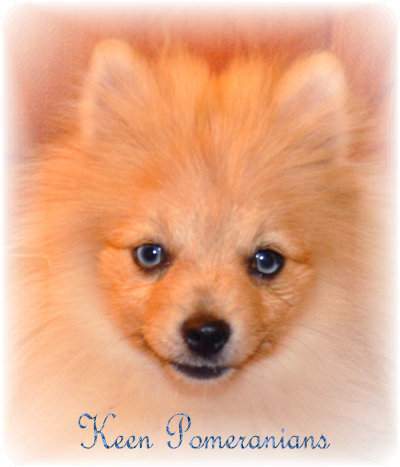 Poms actually have several eye colors. Some aren't seen that often. 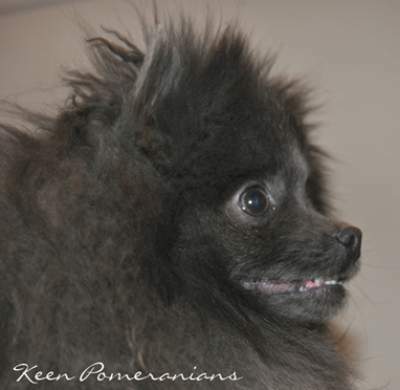 Current ACK breed standard is really messed up right now regarding eyes. They don't mind "self coloring", meaning hazel on chocolate dogs and a blue-ish look on blue dogs. 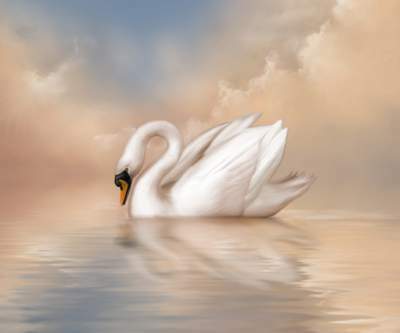 They decided blue eyes, which are naturally occurring in whites sometimes, and are helpful genetic indicators in merles, are taboo. 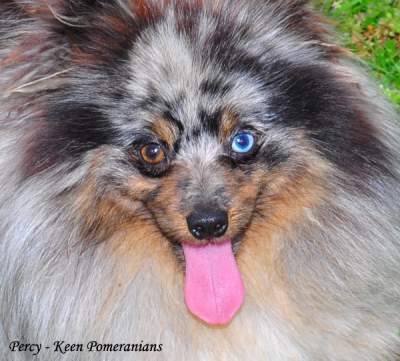 I sure hope they change that because not only are the blue eyes beautiful, but it helps people know if the dog is possibly a merle instead of causing yet more confusion regarding merle Poms. 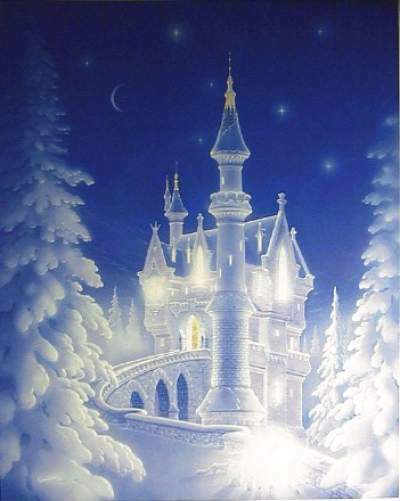 You can read more about merles on my link here. Now, back to eye colors! 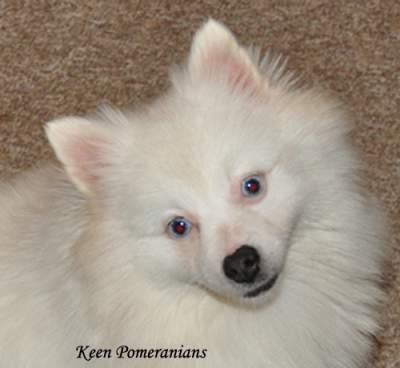 Below you are going to see photos of several kinds of Pom eye colors. Warning! This is a long page! 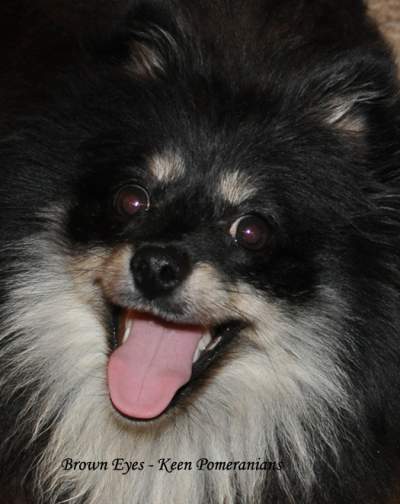 My Poms smile a lot too, so here are some good smiles, and some lovely eye colors! Classic brown eyes. This is the show standard. Again, show standard brown eyes. I call these "melt your soul" brown eyes. They are a lighter shade and every expressive. 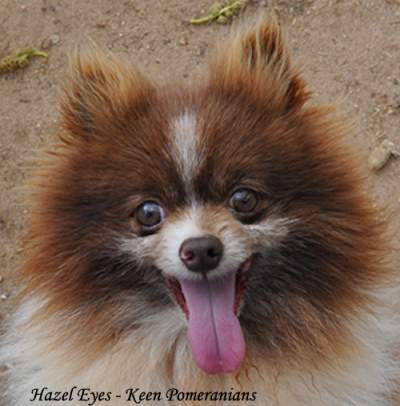 Hazel eyes are called self-coloring because this dog is a chocolate base. Gold eyes. These brown eyes are headed towards yellow. 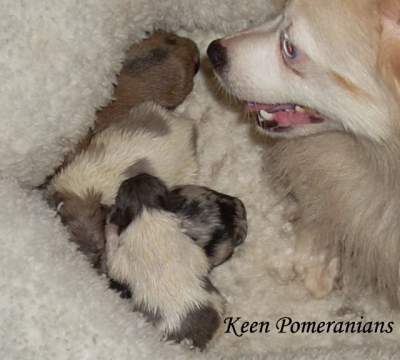 I think they are beautiful, and the more gold or yellow the more recessive genes the dog has. Self coloring eyes. 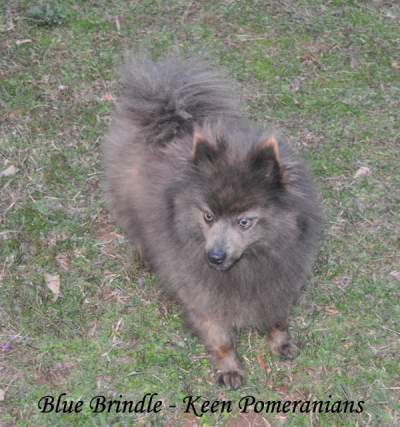 Hazel on a blue pom. Yellow eyes. I will get more photos of this color up soon. 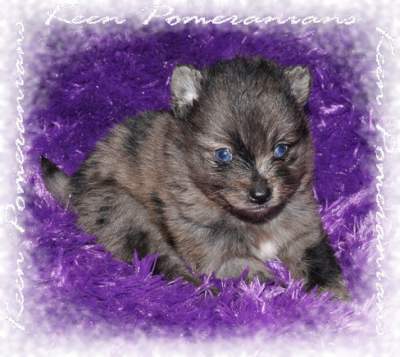 This is a blue based dog, and the yellow wolf like eyes of this dog are an amazing indicator of the recessive genes this dog carries. The color is very hard to have show up properly on many computers. 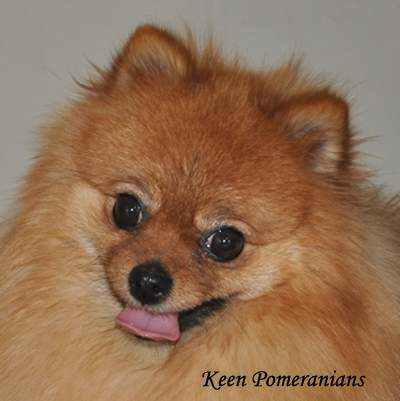 Sure, you can say how horrible this Pom is to the show standards, but you'd be loosing all the uniqueness of the genes. 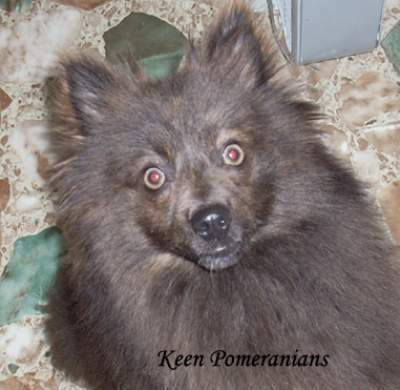 Yellow eyes like this make the Pom who has them look like a wolf. In good sunlight you can see how amazing Percy's odd eyes are. 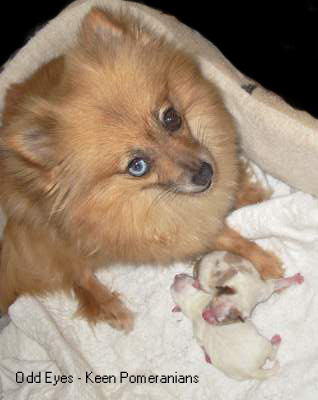 One soft brown, and one blue. His blue eye comes from his merle genes. 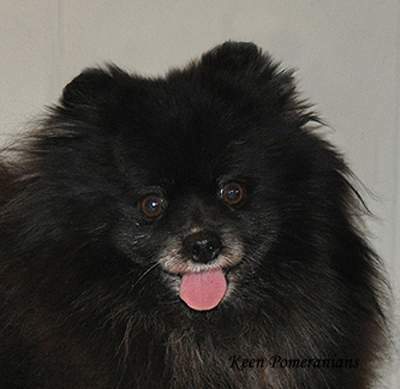 Another example of odd eyes in a Pom. 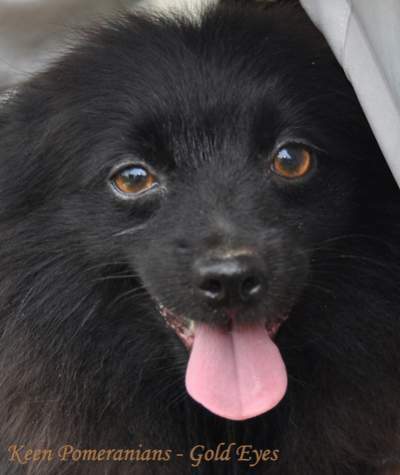 The brown eye in this girl is darker than Percy's. Again, her blue eye is due to her merle genes. 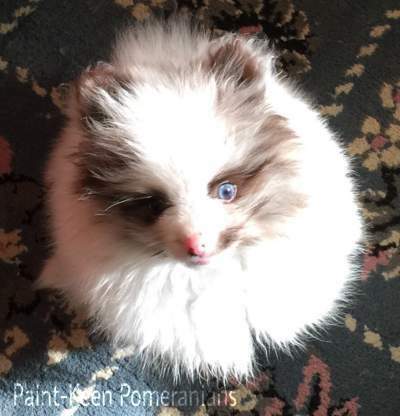 Odd eyes on a Chocolate Merle Parti. 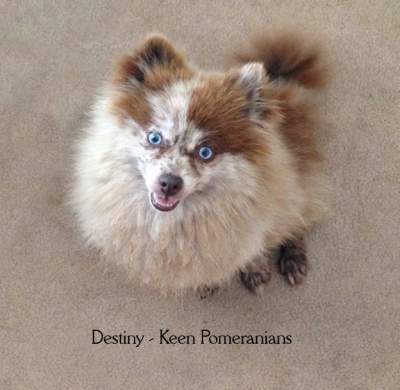 The odd eye is self-coloring hazel for this Pom. I'll have a better pic of his hazel side soon, but this is my only other odd eyed Chocolate Parti Merle. His other eye is self-coloring. Oh, those most requested, most wanted, double blue eyes. This particular girl is a merle, but there are blue eyed whites without any merle genes in them at all. This is a side view of the same girl's eyes. The color of the blue eyes in a merle is also varying. This boy's eyes are startling bright blue. 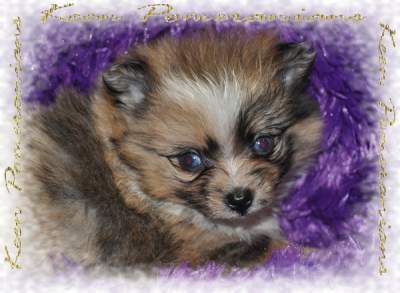 More double blue eyes in an Orange Sable Merle Parti girl. 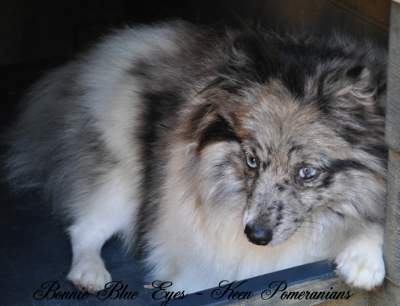 Double blue eyes on an Orange Sable Merle. 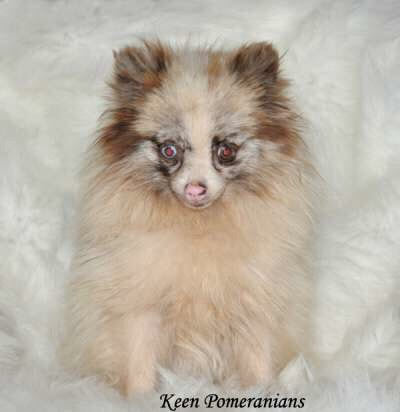 Double blue eyes can come on Chocolate Merle Poms too! 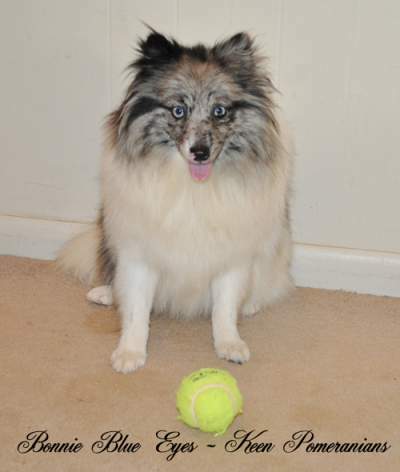 Icy double blue eyes on a Blue Parti Merle. Same girl, same icy blue eyes just without the close up.